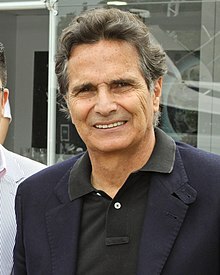 Nelson Piquet Souto Maior (born August 17, 1952), more commonly known as Nelson Piquet, is a Brazilian racing driver who was Formula One world champion in 1981, 1983, and 1987. He is one of the few men to win at least three world championships in the history of Formula One. The others are Jack Brabham, Jackie Stewart, Niki Lauda, Ayrton Senna (3 each), Alain Prost (4), Juan Manuel Fangio (5), and Michael Schumacher (7). This page was last changed on 26 April 2017, at 05:46.